One of the most under-rated aspects of being an ethical vegan is the sense of community it offers. I love meeting other vegans and gushing about the best new dairy-free ice cream on the market or swapping recipe tips. I especially love meeting vegans who bring their passion for animals and a cruelty-free lifestyle to work with them. Even better? Meeting folks who create a business that centers around and celebrates being vegan. And I love connecting vegan consumers with businesses that they can feel good about supporting. So today I bring you the first in what (I hope!) will be an ongoing series, where I’ll chat with vegan small-business owners to share their stories and help bring a little publicity to their good work. 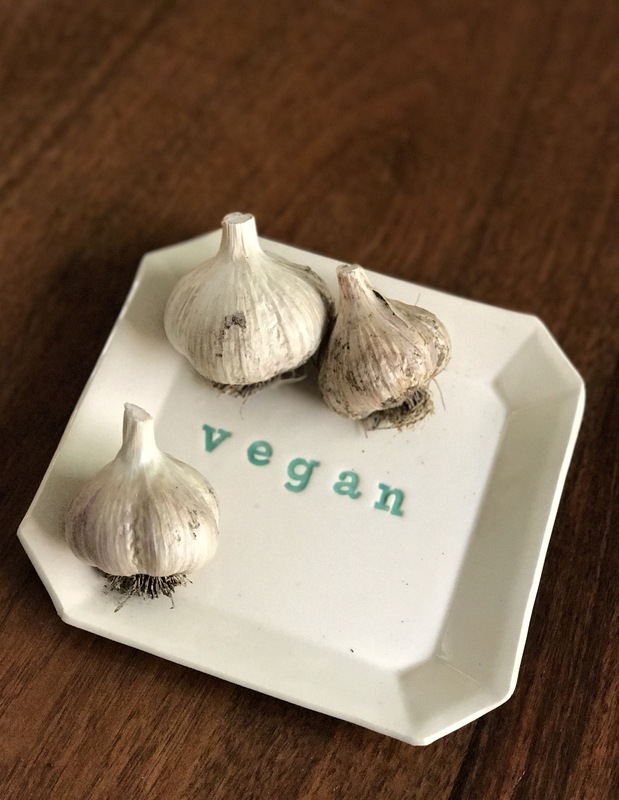 I’m starting with the Vegan Potter, a fabulous Connecticut-based small business run by Lyndsay Meiklem. I first learned about the Vegan Potter from my mom, who encountered Lyndsay and her pottery pieces at New England VegFest earlier this year. Mom enthusiastically shared what she’d learned about this fantastic business and gifted me with a small appetizer plate (see left! ), which now has pride of place on my counter. 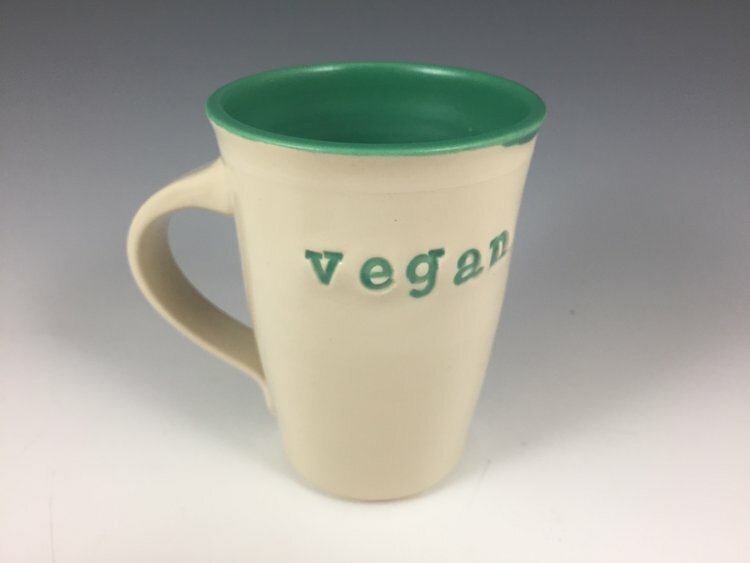 With any luck, you, too, can own a vegan-emblazoned piece of original pottery! Read on for my interview with Lyndsay, and don’t miss the giveaway at the end. Which came first: the veganism or the pottery? The veganism came before the pottery. I went vegetarian at age 17 when I was still in high school. Vegan at age 19 in my second year of college, and I started taking pottery classes at age 20. I became a vegetarian after researching the food industry and animal rights for an opinion paper in a high school English class. Two years later I came home from college and worked at a health food store. The owner was well-versed in many health and wellness issues (keep in mind, this was in 1994!). She encouraged me to read a book called Diet for a New America by John Robbins, son of the Baskin-Robbins ice cream empire. Each chapter focused on an animal and recounted in a very factual and non-inflammatory manner how our food industry processes the animals for human consumption. When I got to the chapter about how milk and eggs are produced, I felt like a total hypocrite for claiming that my reasons for being a vegetarian were motivated by animal rights, because the conditions that laying hens and milking cows endure are equally as deplorable as those in which animals are raised for slaughter. When I went back to college that year, I went vegan. Your spoon deserves a beautiful resting spot. How did you get started as a potter? I studied English and Creative Writing with a minor in Art History at Concordia University in Montreal, Quebec. 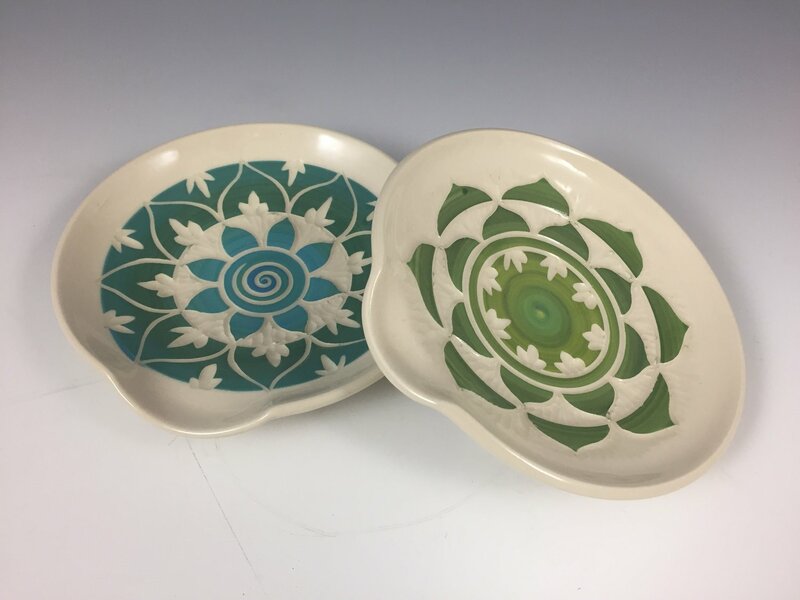 I always loved the arts and had taken many metalsmithing and photography classes in high school but actually dropped a ceramics class in my senior year because I didn’t like getting my hands dirty. I signed up with my boyfriend at the time, and in the first class it was very clear this was not a teaching studio. The teacher gave us a quick demonstration and then left us on our own. I found out a few weeks later that the ‘teachers’ simply got use of the studio in exchange for teaching a class. During the pottery session my relationship ended, and as a result I spent ALL my free time in the clay studio, which was open most nights and weekends for practice. I watched and I practiced and after just a few weeks I remember calling my parents in Connecticut and having a conversation with my dad in which I recalled something he always told me: “Find what you LOVE to do and then find a way to make a living doing it.” I knew I had found what I love. 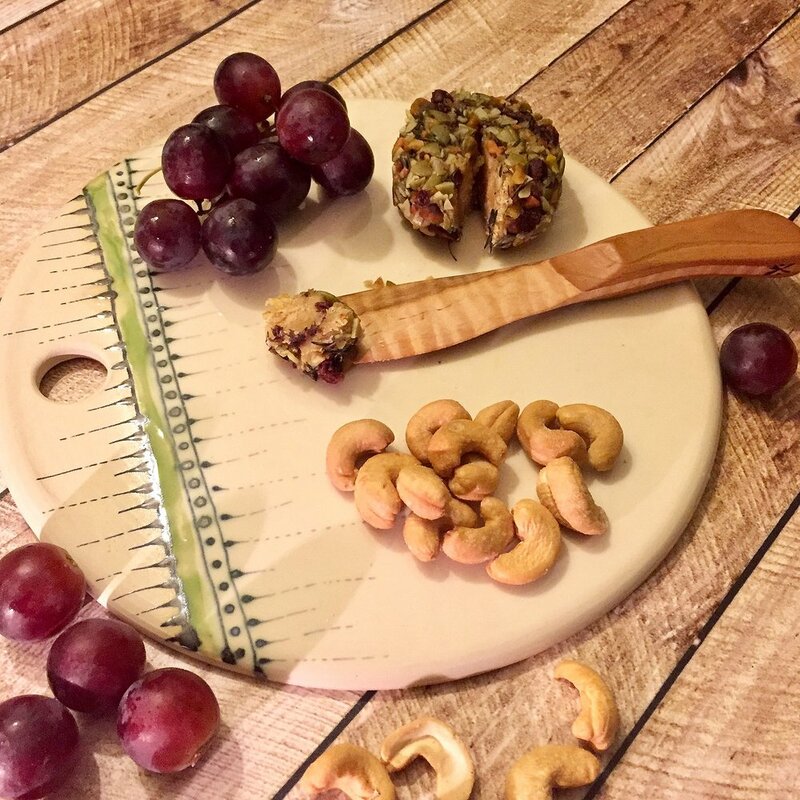 Cheese board and knife, complete with vegan cheese. I continued to practice at that Montreal studio for another year when I had a thought: to open a pottery-teaching studio back in my hometown of Norwich, Connecticut. I tested my skills and endurance and spent the next two summers teaching 7- to 15-year-olds at a residential camp in southern Maine. I got a TON of practice teaching and honed my own throwing skills over the next two summers and then moved back to CT and spent the next year making pottery in my parents’ barn, which had no running water. I lugged 5-gallon pails and used a wood stove for heat and I threw pots on a partially motorized kick wheel. In 2002 my dad rented me a small building next to his furniture craftsman shop, and after a few weeks of renovations and using a good portion of my savings buying 10 brand new pottery wheels and a kiln, I began my business. I’ve been teaching ever since, and in 2006 I purchased a property with two buildings on it and renovated one into a 2,500 square foot art studio, gift shop, and office. In the years following I renovated the building next door into a yoga and wellness studio and we’ve been thriving ever since. How do you describe the type of pottery you create? Functional one-of-a-kind stoneware made with love. What does a day in the life of a full-time potter look like? I imagine it varies greatly depending on where you are in the process for each piece! You’re right! Each day is very different, but in the past 15 years since starting my studio, a TON of time has been devoted to running the business! For the first 10 years I had my wheel in the main studio space where classes were held and over 40 students a week filtered in and out. When I added on to my building and created a 12 x 12 dedicated studio space for my own private workspace, things began to change. I was able to spend more time diving back into my craft and have fallen completely back in love! 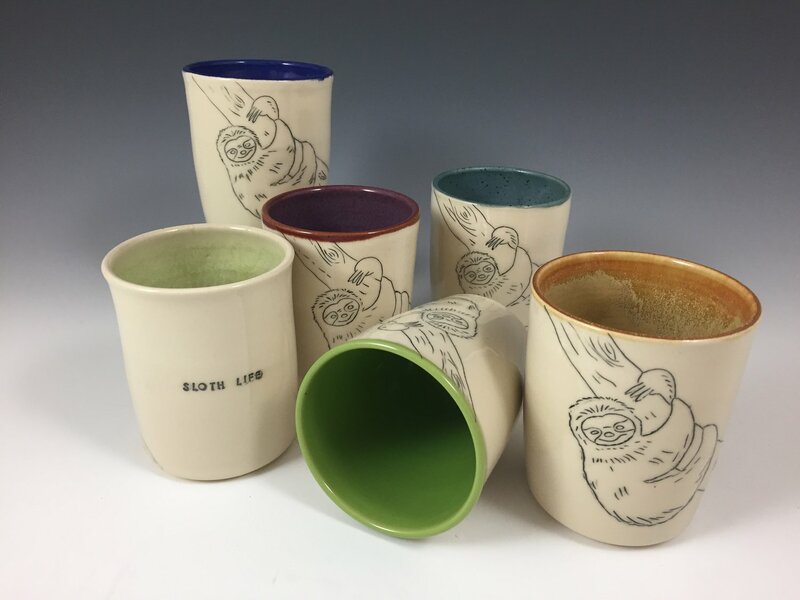 Fabulous “sloth life” tumblers in lots of colors. The making cycle often goes like this: Throwing pots on Tuesdays, trimming and finishing Tuesday’s pots on Wednesday/Thursday, and sometimes finding a few hours of hand-building time. Saturdays are often glazing days. I also teach four adult pottery classes each week, and loading and unloading kilns eats up at least a few hours each week. When I’m in the studio, I work 12- to 13-hour days. When I’m not in the studio, I’m thinking about what I’m going to do the next time I’m in the studio! Coming into the holiday season I’m in high production mode, and some weeks are devoted to packing and readying for weekend shows and events like veg fests! If you visited the home of someone who’d purchased some of your pieces, where would you hope to see them? Typically my work lives in the kitchen or dining room! I absolutely love seeing my work in use, filled with home-cooked food. As you create new styles and lines, what inspires you? I’m equally inspired by nature and function. I’m obsessed with drinking vessels and most recently began experimenting with a new clay body. I thought I was going to use it on its own but realized I could combine my white and brown clay and it gave me the opportunity to play with techniques that leave wonderful swirls and organic lines throughout the pieces. This encouraged me to want to leave the exterior of the pieces as raw clay. The finished work reminds me of wood grain AND swirled ice cream all at the same time. When I have time to play and vary from tight deadlines or set projects, I’m able generate new forms or ideas for pieces. The medium has held my attention because I’m constantly learning and honing my skills making new forms or playing with new colors. What motivates you to include overtly vegan messaging in your work? I’m thinking both of your pieces that include the word “vegan” and your social media accounts, which show lots of vegan love. Do you consider your work a form of activism? I’ve always made a few pieces here and there that said “vegan” or “ahimsa,” a yogic word for “non-violence,” but in recent years I’ve had many more people ask me about my food choices and I’ve run a few vegan-eating info programs at my studio. Last winter I had a revelation when I discovered a holiday gift bazaar that was ONLY for VEGAN vendors — Compassionfest in Hamden, CT. 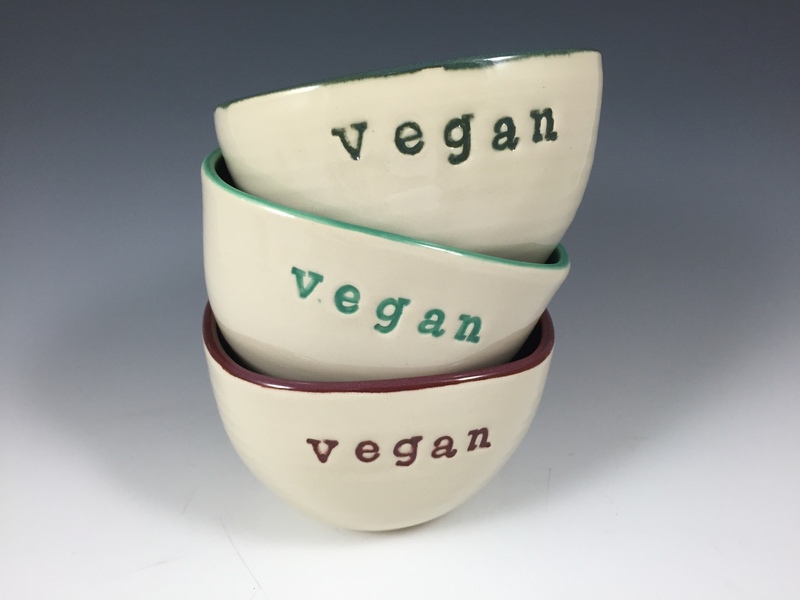 I created a few pieces of pottery that said “vegan” and they were the first things to sell. I realized I had found my tribe and I got much more serious about the Vegans Unite collection. Since then, it has grown to include bowls, bread plates, mugs, tumblers, ornaments, and magnet sets. No one will think your ice cream is dairy-based when you eat it from this bowl! I’ve always used my social media accounts to discuss my food choices in non-inflammatory ways by simply posting pics of delicious food, which are often enough to spark discussions with folks about veganism. In the past 20 years, I have seen a tremendous amount of change here in the Northeast. 20 years ago, the only brand of milk alternative was soymilk in tetra packs and it tasted terrible. Health food stores were far and few between and bulk food was just making an appearance. There were NO meat replacements or protein sources outside of tofu (which you certainly couldn’t find in a mainstream grocery store). We have come a really long way in the past two decades BUT I have also noticed a trend for new vegans or vegan curious to lean heavily on the vast array of “fake” meat and protein replacements that are so abundant now in mainstream stores. When you’re not eating delicious vegan food or creating beautiful pieces, how do you spend your time? I love taking day trips with my husband to explore New England towns and seek out vegan restaurants. I can also be found taking photos of the local cover band my husband plays in. And finally, do you have any companion animals? Who are they? Living in a very tiny studio apartment we don’t have any pets but our dream is to build an earth berm home and we have big plans for several companion animals when that happens! The perfect vessel for your garlic. Any vegan dessert! I’m a sugar-holic! Crazy Burger in Narragansett, Rhode Island. Although they are not exclusively vegan, they have an extensive vegan section on their menu and they catered our wedding! Vacation? What’s that? When you do what you love, there is little time for time away! Vitamix for smoothies, and I love my microplane for zesting and grinding fresh nutmeg and herbs. I can’t think of any animal I don’t love! Someday I’d love to meet elephants! From 77 entries, the randomly selected winner is Judith Rontal. Judith, I’ll be emailing you to get your information. Thanks for entering, everyone! Lyndsay has graciously agreed to give a lovely mug from her vegan collection to one lucky reader! Enter below to win the vegan mug with turquoise trim. 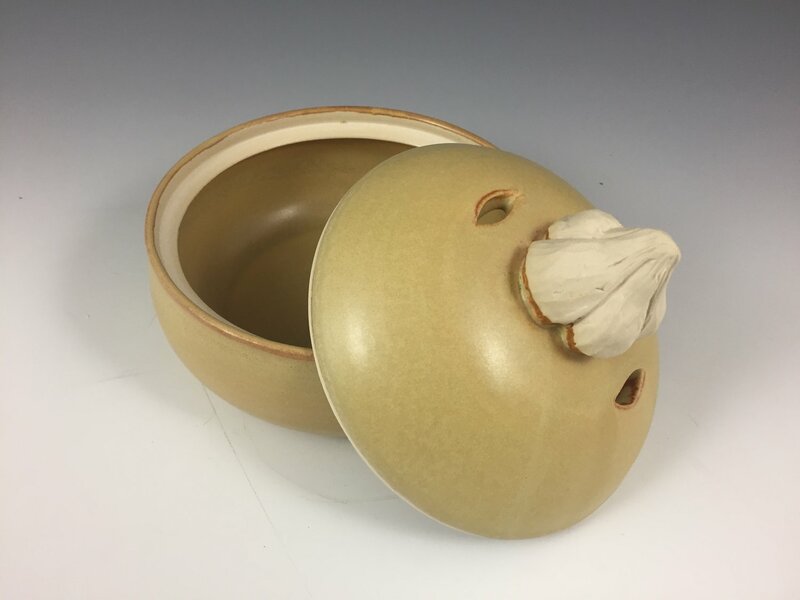 The only thing you must do is visit the Vegan Potter website and leave me a comment saying which of her pieces appeals to you most. Then fill out the Rafflecopter form below. (Only Rafflecopter entries are eligible!) You can rack up extra entries by completing a few other tasks. This giveaway is open to both U.S. and international readers! Giveaway closes at 11:59pm, EDT, on Tuesday, September 5. Good luck! What gorgeous work! I especially love the hugging bowls. At this point, I’d say the sponge holders are my fave, because they’re practical and I don’t have something like them already. My favorite pieces are the Vegan bowl and mug, so lovely ! Great to see vegan entrepreneurs doing what they love and spreading compassion. thanks for this article. I like the the vegan mug. I love the dish! I would use it to hold jewelry. The swirl tumblers are my favorite! The Mandala plates are gorgeous! I love the sloth life cups! I’m really loving the cheese board. Its very practical and something I think a lot of people get a lot of use out of. I could see myself making a cashew cheese spread with grapes for entertaining. This is awesome! When you think about a vegetarian or vegan lifestyle, you don’t always immediately think about the products you are using that may use animal by-products. I think it’s great that there are makers out there who are giving people a different option! Completely agree! Thanks so much for your comment. I love the “sloth life” mugs. I’m not a vegan, but I found this interview fascinating! Her story is so great, and you did a wonderful job getting her to tell it.